According to data ascertained by diplomatic establishments abroad through their Japanese citizen protection work in2003,overseas offenses committed by Japanese nationals increased by19.9%from2002to609cases,and Japanese nationals offenders also increased by25.5%from2002to734persons(Source Data:Consular Affairs Bureau,Ministry of Foreign Affairs). Fig. 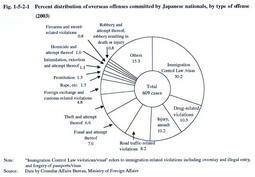 1-5-2-1 shows the percent distribution of overseas offenses committed by Japanese nationals in2003,by type of offense.Immigration Control Law violations/visas had the largest share at30.2%(184cases),followed by drug-related offenses at10.3%(63cases),injury and assault at10.2%(62cases),road traffic-related violations at8.2%(50cases),fraud and attempts thereof at7.9%(48cases),and theft and attempts thereof at6.6%(40cases).